Pop up stores have become increasingly common as brands and retailers look to create new ways to heighten the brick and mortar arm of their operations. A temporary storefront - usually created for a specific purpose - pop ups are now being used by not only niche brands and retailers, but the likes of adidas, Ralph Lauren, H&M, and many more. Why are these big brands jumping on the pop-up bandwagon? Read on to find out. Not just a recent fad, the pop-up store phenomenon has existed for over a decade. Originally used as a means for niche brands - or the likes of local artists and creatives - to create a more holistic shopping experience for their products, the concept of having a temporary storefront has evolved as increasing amounts of companies have seen value in building them - and their brands at the same time. As increasing amounts of clothes shoppers move online - in 2016 the global fashion ecommerce industry is valued at $54 Bn and growing (source: Internet Retailer) - there is a clear need for brick and mortar retailers to offer experiences that connect to their audiences. Online shopping, due to being more practical for most, means that shoppers simply aren't going into stores as much. This is especially true when it comes to millennials. However, brands have learned that the millennial generation is more attracted to experiences - the recent rise of 'experiential marketing' makes this no false conclusion. The idea has now shifted for many brands to focus on creating exciting reasons to physically come in store - offering customers experiences instead of just products. A recent, particularly creative example of this was Parisian fashion house Hermès' Hermesmatic store concept to celebrate their 80th anniversary. Dressed in a bright orange, retro 80's style, the new retail concept encouraged Carrés silk scarf owners - the brand's signature product - to come in store for a professional dry cleaning and dip-dye treatment. Of course, there was an opportunity for shoppers to purchase the scarves and tweet some pictures along the way. Pop up stores have been identified by keen-eyed brand strategists as a way to generate coverage for a new campaign. Whilst no retailer in any traditional sense, Kanye West's recent launch of pop-up stores in 21 cities around the world was marketed via his website to his 26 million twitter followers. 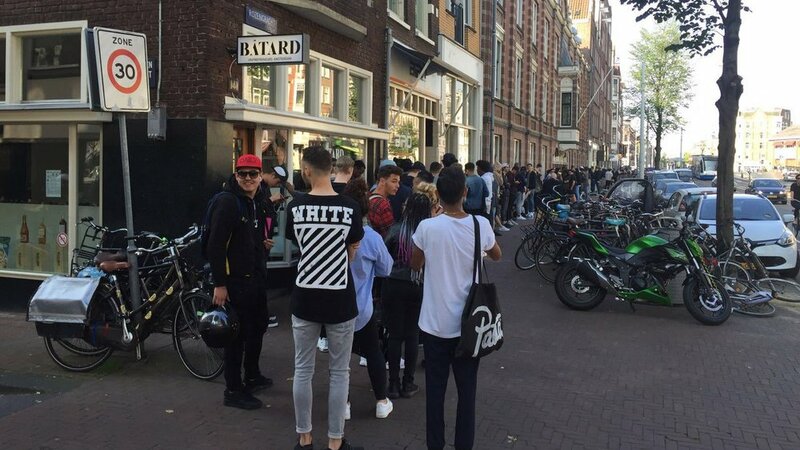 Knowing that hordes of fans - and online resellers - would flock to these physical spaces to purchase several limited run pieces, the pop up stores acted as a way to showcase the upcoming merchandise for his Life of Pablo tour. So far, Mr. West has generated millions in merchandise sales during his 2016 tour - even breaking the Pope's record at NYC's Madison Square Garden by selling over $780,000 USD of merchandise in one night. Much of this merchandising success can be attributed to the hype his pop up stores and clothing lines generated in various magazines and online outlets. Launching new collections requires a long, coordinated process between several departments from buying and planning to merchandising. So when it comes to creating a visual merchandising directive that matches the product story, it can help to have a blank store slate to play with. When launching their new DIVIDED collection, H&M decided to pour its budget on creating a 1,100 square foot store in East London. The temporary storefront was completely bespoke and aimed to help reposition H&M's neo-gothic inspired apparel to an older audience. Located in Shoreditch's Old Truman Brewery, the store was designed with a contemporary, minimalist aesthetic with painted white walls. It also hosted several DJs each day to heighten the atmosphere for shoppers of the new collection. Attracting a new generation of customers by reinventing a look is common with a lot of brands and retailers these days. Sportswear has seen a recent rise in popularity - in part due to high profile collaborations with entertainers popular with young demographics. It's not just personalities, however, that can leverage a certain level of cultural appreciation, physical spaces can too. Take Reebok's FLASH store concept. 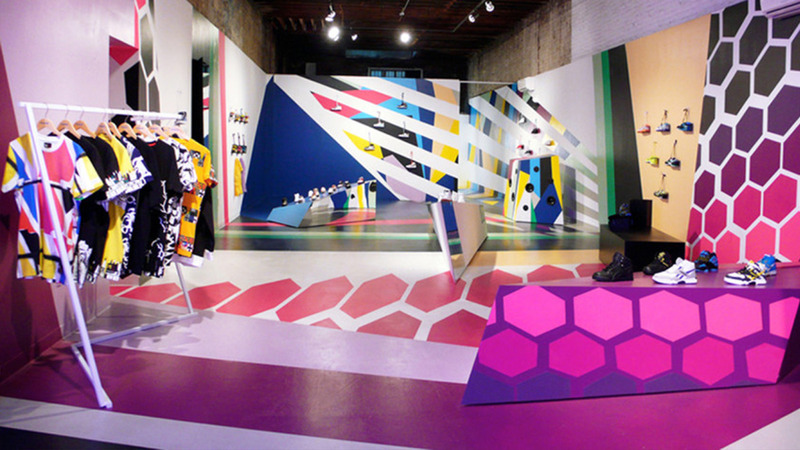 3000 square foot of a New York gallery space was repurposed to showcase Reebok's new collections and signal its shift to being a more 'fashionable' and creative modern brand. The brand's visual merchandisers took great liberty in experimenting with different artistic concepts in their store design. Reebok rotated its products in-store regularly throughout its one month tenancy, meaning there was a real reason for customers to return and experience the brand's urban heritage and cultural roots. Want to see how our technology can help you plan your next pop-up store? Or storyboard an exciting new collection?